With this Mathematica Player Notebook one can see whether four different function classes are orthogonal or not (two-dimensional plots). To start the .nbp-file download it using right-click ("Save Link as..") and open using the Mathematica Player or a full version of Mathematica 6. This Matematica Player Notebook can be downloaded (right-click->save link as) and used without a Fullversion of Mathematica 6 (but you will be unable to modify the code). Just download the free Player from the Wolfram Website. Download link to the freeMathematica Player (Mac, Linux, Win). 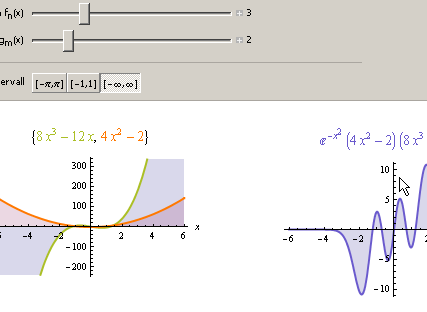 Find more Visualisations in the Wolfram Demonstrations Project.